The Black Sticks Women have powered back from two goals down to draw the sixth test 2-2, and claim an overall series win over hosts Argentina in Mar del Plata. World number two ranked Argentina made a strong start scoring twice in the opening quarter, and held their advantage on the scoreboard for most of the game. But with less than four minutes to play the Kiwis pulled one back through Kirsten Pearce before Kayla Whitelock scored a brilliant goal in the final minute to equalise. The six test series concludes with two wins, two losses and two draws with the Black Sticks clinching the Mar del Plata Sport Cup thanks to a better goal differential. Goalkeeper Amelia Gibson brought up her 50th test cap in the draw. Head coach Mark Hager said his side showed character in continuing to fight from two goals down to eventually level the score. “We made a poor start to the game and were a bit apprehensive, but the way we fought back was pleasing,” he said. “This trip has been a good adventure for us against a very good opponent and to be able to come away with a series win is a real positive. The Black Sticks now head home to New Zealand to prepare for two tests against Canada over Easter weekend in the build-up to the Hawke’s Bay Cup from 2-10 April. The Black Sticks have left it late to come away with a 2-2 draw in the sixth and final hockey test against Argentina in Mar del Plata. New Zealand trailed 2-0 with five minutes to play, before Stacey Michelsen and Kayla Whitelock found the back of the net to level the scores. The six-game series is drawn 2-2. Coach Mark Hager says being up against it probably worked in their favour. "We made a poor start to the game and were a bit apprehensive, but the way we fought back was pleasing," he said. "This trip has been a good adventure for us against a very good opponent and to be able to come away with a series win is a real positive. "We have identified some strengths and weaknesses from these six games. We came here with some questions and feel like those have been answered." The Black Sticks now head home to New Zealand to prepare for two tests against Canada over Easter weekend in the build-up to the Hawke's Bay Cup from April 2-10. As the Rio Olympics loom larger, New Zealand women's hockey team coach Mark Hager says their series victory in Argentina has answered some questions. Trailing 2-0 with four minutes to play and headed for a series loss in the sixth and final test at Mar del Plata on Friday (NZ time), the Black Sticks rattled in two late goals to draw the clinch the Mar del Plata Cup. While it was a series win on goal difference after each team won two and lost two matches and the other two were drawn, it was a satisfying result for the world No 4 ranked Kiwis against their second-ranked hosts. It backs up New Zealand's runner-up finish behind Argentina at the World League Final tournament in December and Hager indicated the tour had continued their steady progress towards Rio. "This trip has been a good adventure for us against a very good opponent and to be able to come away with a series win is a real positive," he said. In the final test, it was the home team who shot out to an early two goal lead at the end of the first quarter as Julieta Jankunas and Noel Barrionuevo both got on the scoresheet. The Argentinians held that advantage through the next two quarters and looked all but certain to claim the series spoils with just five minutes remaining in the match and the score unchanged. But the Black Sticks kept their hopes alive when they pulled one back through striker Kirsten Pearce and in the final minute vastly experienced returning midfielder Kayla Whitelock scored a brilliant equaliser. Hager felt his side started the game poorly and were "a bit apprehensive", but was pleased with the way they fought back in the dying stages. New Zealand return home to to prepare for two tests against Canada in Hamilton on March 27 and 28. The Kiwis then host Australia, China, Korea, Japan, India, Ireland and Canada in the Hawke's Bay Cup from April 2-10. Scotland Senior Grand Masters put on a creditable performance against their English counterparts at Glasgow Green on Wednesday 2 March 2016. Sterling performances from Captain David Cassell in the heart of the Scottish defence and new cap, keeper Nigel Dixon, prevented England from creating any real chances from open play. England nearly scored from a short corner but a superb double save from Dixon kept the scoresheet blank. At the other end, Scotland could have had a penalty from their only short corner when Cassell's shot was defected upwards off a defender's stick and hit an English body on the line. The umpire ruled that the ball had gone high from the initial hit and England breathed a sigh of relief. The match ended 0-0, a fair reflection of the play. Squad: Alan Bremner, David Cassell (Captain), Roy Crichton, Nigel Dixon (GK), Ian Downie, Andy Ferrol, David Margerison, Doug Morrice, Donald Paterson, Alistair Philip, Robbie Robertson, Alan Strachan, Colin Tucker, Doug Turner, Sandy Weir. Key hockey defender Birendra Lakra on Thursday underwent knee surgery at Mumbai’s SportsMed Facility under renowned orthopaedic specialist and sport injury expert Dr Anant Joshi. The 26-year-old suffered a ligament rupture in the right knee during the Hockey India League Season Four last month, ruling him out of the tournament, and also putting a question mark on his availability for the Rio Olympics in August. Said Dr Joshi from Mumbai, "The surgery on Birendra Lakra was done this morning. In medical terms, we call it the anterior cruciate ligament reconstruction (ACL). It is a common sport injury but requires time to recover. His ligament is broken and in such a situation when the foot is planted, any twisted body movement becomes near possible. "We have done the reconstruction surgery on the knee to restore its function. He will need to wait for three months before beginning his training and a rehabilitation programme." Lakra thus will miss out on the Azlan Shah tournament in April, and also the proposed tour of Europe in May. The national squad will gather in Bengaluru on March 7 to begin preparations for Rio, and chief coach Roelant Oltmans will have a lot on his mind with key players carrying injuries. Besides Lakra, midfielder Devindar Walmiki (shoulder), striker Lalit Upadhyay (ankle) and goalkeeper P.R. Sreejesh (shoulder) are also undergoing rehabilitation. There is no doubt that without Lakra, the defence structure will have to undergo several changes. India, who have had a perennial problem in defence, have looked stable since Lakra’s arrival two years ago. In 2015, he was named the player of the year in Hockey India’s annual awards underlining his calibre and talent. Added Dr Joshi, "There are cases when players recover a little early too. It is good that he has a dedicated physiotherapist in Shrikant Iyengar (Team India physio) and a proper exercise regime can see him back on the field in four months." Scotland lost their final friendly international 5-1 against Germany in Stellenbosch (South Africa), but pride of place must go to Dundee Wanderers` Charlotte Watson, the Tayside teenager scored her first Scotland goal to put her side a goal up in the first quarter. The senior squad newcomer drove into the circle, then made her way along the base-line and calmly slid the ball under the goalkeeper for the opener. The Scots had other chances to add to their lead, they had three penalty corners which came to nothing, but the best chance fell to Edinburgh University`s Becky Merchant whose reverse stick shot cannoned off a post to safety. The clinical Germans were soon back in the game and reached the interval 3-1 ahead. The Scots had several chances in the second half, Nicola Skrastin and Watson had the best of them but were foiled by the goalkeeper, but the Germans added to their total with two further penalty corner conversions. Although the Scots only won one of their six international matches against teams well above them in the international rankings and preparing for Rio, coach Gordon Shepherd was delighted with the trip to South Africa. "We achieved all the targets that were set and more, there were no underperformers and some players did better than expected," said Shepherd. "This was a worthwhile exercise and it looks promising as we prepare for the World League in 2017." Although Scotland lost the second friendly international 3-0 against India at Stellenbosch yesterday, coach Gordon Shepherd was pleased with the overall improvement in his squad`s performance from the first game which they lost 5-0. It was hardly a level playing field, Shepherd is just starting a squad rebuilding programme for important tournaments in 2017 while India, four places above the Scots in the world rankings, are in the final throes of preparation for the Rio Olympics. The Indians managed to score twice in the first half, yet the Scots had several chances to find the net, Robyn Collins had a couple of opportunities from penalty corners while Becky Merchant and Fiona Burnet came close from open play. The Scots dominated the second period but against the run of play India added another. In reality the Scots had the better chances, again Collins was twarted by the Indian goalkeeper at penalty corners while Merchant, Millie Brown and Nicola Skrastin also found the same barrier from open play opportunities. "I`m delighted with the improvement from the first Indian game, this time I felt the score flattered them and there were certainly not three goals in the game, so this is very encouraging given we only had five players in the squad from last year`s Europeans," said Shepherd. Rebuilding an international squad can sometimes have growing pains, Scotland`s women lost their first two games against South Africa 2-1 and 8-1 in Cape Town, but it all came good yesterday with a well deserved 1-0 win to finish the three test match series on a high. Although Gordon Shepherd`s charges lost the overall series a win over the world number 11, six places above them in the rankings, is a huge achievement on their own patch. The first half was goalless, it was the Scots who had the better chances with four penalty corners and other open play opportunities, the best of them fell to Becky Merchant and newcomer Heather Howie. Early in the third quarter the Scots struck at another penalty corner, Becky Ward switched the ball on to Robyn Collins and the Surbiton striker buried the chance into the bottom left hand corner of the net. The Scots did not retire into their shell to protect their precious lead, in contrast they pushed to add to their tally, Merchant was unlucky to see her shot rebound off a post while Howie had several dangerous runs into the circle, but there was no further addition to the score. "This was a fantastic team performance, the girls raised themselves after yesterday`s disappointing poor result. This was no scraped victory, the squad thoroughly deserved their victory with a powerful performance on the day," said Gordon Shepherd, Scotland`s coach. Xavi Lleonart - in video action below - says “physicality and intensity” will be the key component when Real Club de Polo and Club Egara meet in the EHL KO16 on March 26. It is a repeat of the last two Spanish league finals with Polo winning out on both occasions and Lleonart told the EHL website that it is a “rivalry that has grown quite a bit lately”. “It is usually a physical game and intensity plays the main role; we tend to be very equals, so this is what we can expect as a start for the KO16. Asked about playing a side so close to them, one that Polo meet on regular occasions in their domestic club competition, Lleonart says that the draw has positives and negatives. “On one hand, we know each other pretty well; on the other hand, it means losing some of the essence of the EHL which is having the chance to play against europe teams that you don't usually play. “This will be my third participation in the EHL and it is always an exciting competition to play. The last few editions, we did not have such good luck so let's hope this year makes the difference! His side are currently in great form; Polo have won 11 of their 12 league games and most recently beat Club de Campo 3-2 with Lleonart, Alex Casasayas and Matias Rey scoring the goals. They face RS Tenis next weekend before playing in the Copa del Rey playoffs on March 11 to 13 where they can pin down a possible EHL place for 2016/17. They beat high-flying Reading last weekend, and relegation-threatened Hampstead and Westminster face a crucial double-header weekend in the Men’s Hockey League Premier Division. A win and a draw last weekend helped them move up to eighth, and Hampstead have games against defending league champions Wimbledon and strugglers Cannock this weekend. “By Sunday afternoon we will know what we have to do,” said manager Thea Hitchcock. “Hopefully we will have two wins, and will be safe for our final match against Holcombe. Throughout the Premier Division programme this weekend, almost every match sees teams desperate for points to cement their place in the League Finals weekend at the Lee Valley Hockey and Tennis Centre in London on April 16-17. Reading will be looking to bounce back from their defeat to Hampstead and Westminster last weekend as they play Cannock on Saturday and play-off rivals Surbiton on Sunday. East Grinstead play host to Surbiton on Saturday, before another home game against Wimbledon on Sunday. Brooklands Manchester University have lost just one league match since October, and will be looking to show good form as they go to leaders Holcombe on Saturday and bottom of the table Canterbury on Sunday. The other top flight game on Saturday sees Canterbury host Beeston, while the final Premier Division match on Sunday is Holcombe against Beeston in Kent. There are still three teams in the hunt for the Men’s Conference East title, but leaders Southgate are in the driving seat and host West Herts on Saturday. Second-placed Richmond entertain Oxted on Sunday, while third-placed Sevenoaks go to Bromley and Beckenham on Saturday. In the Men’s Conference West, bottom of the table Chichester Priory Park need to win both their remaining games – and hope Guildford lose both theirs - to avoid automatic relegation. But Chichester Priory Park face second-placed Team Bath Buccaneers on Sunday, while champions Cardiff and Met hosts Isca. Four teams are still in danger of relegation in the Men’s Conference North, with bottom of the table Lichfield preparing to face Sheffield Hallam on Sunday, while Olton and West Warwicks go to Deeside Ramblers in desperate need of points. Wakefield’s draw at Preston saw them climb up to eighth, and they go to Doncaster in search of more points to stay clear of the relegation battle. Bowdon Hightown face a tough double-header weekend, as they bid to avoid relegation danger in the Investec Women’s Hockey League Premier Division. Play-off hopefuls Holcombe host the Cheshire side on Saturday, and are desperate for points to climb into the top four and make it to the League Finals weekend on April 16-17 at the Lee Valley Hockey and Tennis Centre in London. But Bowdon will then have 24 hours to recover before they go to Surrey to take on Surbiton. “We’ve been playing well, but just not getting the results,” said Bowdon Hightown manager Roger Hunt. “Winning against Leicester last weekend was encouraging, not only because we kept a clean sheet but because we scored two good goals which has been our downfall sometimes. Prior to Sunday’s clash with Bowdon Hightown, Surbiton are hosting play-off hopefuls Clifton on Saturday afternoon. Also hoping to clinch a spot in at the Finals Weekend are East Grinstead, who face a tough match at top of the table University of Birmingham. Canterbury are already assured of a place in the top four, and they travel to bottom of the table Buckingham for a match which could see them go top of the table. Also in with a chance of reaching the top four are Leicester and Reading, and they play each other at Leicester Grammar School on Saturday. The loser could see themselves drawn into a relegation battle, depending on the results of Bowdon Hightown’s two matches. In the Investec Conference East, Slough could wrap up the title and a place in the promotion play-offs if they beat visitors Wimbledon on Saturday. Second-placed Cambridge City will be hoping they can beat Ipswich at home, and their rivals lose, to maintain their slim hopes of taking the title. Any one of four teams could still take the title in the Investec Conference North, with Wakefield top and four points ahead of second-placed Beeston. Wakefield head to Liverpool Sefton this Saturday, while Beeston go to fourth-placed Ben Rhydding and Brooklands Poynton entertain Loughborough Students in the hope of maintaining their promotion hopes. Leaders Sutton Coldfield are at home against Oxford Hawks as they bid to wrap up the Investec Women’s Conference West title and secure their place in the promotion play-off. Stourport could pip them though, and they head to Gloucester City. Bigger and better than ever before! This year the culmination of the Investec Women's Hockey League and the Men's Hockey League all happens over one action-packed weekend. Goals galore. Tension, drama and plenty more besides, the two separate Finals weekends had it all last season. Now, with the men's and women's finals and the promotion playoffs all set to take place over one weekend at the Lee Valley Hockey and Tennis Centre it promises to be the most spectacular end of season we've ever seen. Three of the four places in the Investec Women’s Championship finals have been secured with reigning champions Surbiton returning to try to keep hold of their crown for a third successive year. The Sugden Road outfit have yet to lose a game this season and can go top if they win their game in hand this weekend. The current leaders, University of Birmingham have had a fantastic campaign both indoor and outdoor. Phil Gooderham’s side reached the Super 6s semi-finals for the first time and have also secured a spot in the outdoor playoffs, also for the first time. Their side reads like a who’s who of junior international players with a smattering of experienced heads in there for good measure. They will be exciting to watch. Canterbury, who finished runner-up last year have also booked their place at finals weekend. Once again their brand of exciting, pacy attacking hockey built from a solid defence has stood them in good stead and they will be keen to go all the way this time around. The fourth place is occupied at present by East Grinstead but Holcombe are level on points with the Sussex side and Clifton are three points back from that. Leicester, back in seventh place could creep in if things go their way, too. It is very much all to play for to take the final slot at the finals weekend from the Investec Women’s Premier Division. The Men’s Premier Division is also taking shape. Holcombe’s star studded team have rocketed to the top of the table in their debut season and became the first side to book their place at the end of season finals. Yet to lose a game they are six points clear with three games to go. In hot pursuit are Reading and Surbiton, who whilst not mathematically qualified will back themselves to pick up the points needed in their remaining games. That leaves the final qualifying place, currently occupied by reigning champions Wimbledon, but far from secured. Brooklands MU, just a point behind the Wombles are chasing their first appearance at finals and although they have a tough run-in, they will be poised to capitalise on any slip by the champions. Further back are Beeston and East Grinstead, who whilst not mathematically out of contention, will need to pick up maximum points from their remaining games and hope for a slip by their rivals. East Grinstead face Wimbledon and Beeston in their final three games, whilst the Bees have to see off Holcombe to give themselves a chance. It’s shaping up to be a tense scramble for those all-important qualifying places, followed by a weekend of top class action at Lee Valley Hockey and Tennis Centre to battle for the title. England Hockey and Investec are delighted to announce Investec’s extension as Principal Partner of Great Britain and England Hockey’s women’s game through to the 2020 Tokyo Olympics. Launched in July 2011, the partnership has delivered great success for both parties during a period which has seen women’s hockey scale new heights. Medals at several major championships, including a bronze at London 2012 and a gold at last summer’s Unibet EuroHockey Championships, have been complimented by an upsurge in participation. A 77% increase in junior girls club players, allied with growth across other age groups, has led to a 39% overall increase in women’s club participation since 2011. The four year extension of the partnership will boost Great Britain and England Hockey in continuing to deliver international success, grow the visibility of the game and inspire more people to take part. The agreement maintains Investec’s position as Principal Partner of the Great Britain and England Women’s teams, Women’s Hockey League, Schools Championships for girls, and Investec London Cup - an international invitational tournament. It is a very exciting period for women’s hockey with England Hockey hosting world level events such as the Women’s Hockey Champions Trophy this June and the Women’s Hockey World Cup in 2018, all at the new home of hockey – Lee Valley Hockey and Tennis Centre on Queen Elizabeth Olympic Park. Can UniKL deny Thunderbolts sweep? LEAGUE champions SSTMI Thunderbolts are expected to have a walk in the park when they play Perlis Young Lions Juniors in both the legs of the TNB Cup quarter-finals starting Friday. The five-time consecutive double champions SSTMI have a super record to rely on, as in six years, they have only lost one match -- 2-0 to UniKL Young Guns on 21 Feb.
Perlis Young Lions, on the other end, rose from Division Two and even lost to Anderson Thunderbolts 1-0 in the lower division final. Both the legs will be played at SSTMI's grounds, giving them an added advantage which they do not need. However, if Anderson Thunderbolts pull off an upset it will be a Thunderbolts semi-finals. Perlis and UniKL are the only non-Thunderbolts in the quarter-finals: "For us, we want to go al the way to the final and the first step would be to beat Anderson. Even though they rose from Division Two, I expect it to be a tough match -- but the outcome should favour us," said UniKL coach I. Vickneswaran. However, Anderson team manager Saiyuti Samat begs to differ, as he is looking for a clean Thunderbolts sweep this season. "My players have progressed well this season, and we are only obne step from creating history of having all four Thunderbolts in the semi-finals. "And I believe my players will not disappoint, as UniKL can be beaten," said Saiyuti. For UniKL to deny this upset, they must perform well in the first leg which will be held at the National Stadium in Bukit Jalil. For, return leg will be held at Anderson's den -- the Azlan Shah Stadium. FRIDAY: TNB Cup q-finals First Leg: SSTMI Thunderbolts v Perlis Young Lions Juniors (SSTMI, 5pm), SSP-MSP Thunderbolts v Sabah Sports School (5pm, Pitch II), UniKL Young Guns v Anderson Thunderbolts (5pm, Pitch I), BJSS Thunderbolts v BJSS Juniors (7pm, Pitch II). SUNDAY: TNB Cup q-finals Second Leg: Perlis Young Lions Juniors v SSTMI Thunderbolts (SSTMI, 5pm), Sabah Sports School v SSP-MSP Thunderbolts (Pitch II, 7pm), Anderson Thunderbolts v UniKL Young Guns (Azlan Shah, 5pm), BJSS Juniors v BJSS Thunderbolts (Pitch I, 7pm). Note: Matches at National Stadium Bukit Jalil unless stated. File pix of Anderson-Thunderbolt's another star - Muhammad Nazrul Ashraf Raduwan trying to block Muhammad Izzulazim Mohd Nasir of BJSS. 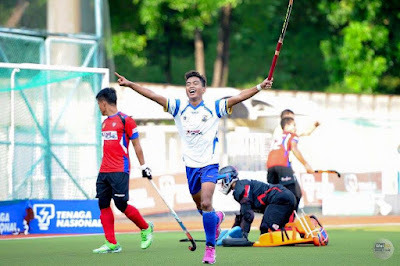 Chan Tak Kong / The Star"
KUALA LUMPUR: Anderson-Thunderbolt will be banking on forward Muhammad Azrai Aizad Abu Kamal to continue their run in the Malaysian Junior Hockey League (MJHL). The 17-year-old Azrai has been pivotal in Anderson’s success so far, scoring 12 goals in eight matches to steer the Perak outfit to the Division Two crown. Anderson will be pinning their hopes on Azrai continuing his goal-scoring exploits when they take on Universiti Kuala Lumpur (UniKL) in the quarter-finals first leg on Friday at the National Hockey Stadium in Bukit Jalil. Anderson, however, will start as underdogs considering that UniKL have a better pedigree, having emerged overall champion in 2010. The KL side also finished second in Division One and overall runners-up last season. Still, Azrai believes Anderson stand a good chance of reaching the semi-finals. “We have already achieved our first mission of winning the Division Two title. Now, we want to go all out to to make the last four. It will be tough, but not an impossible task,” said Azrai. “I hope to score again. But our aim is to secure a draw in the first leg and then go all out in the return leg in Ipoh on Sunday,” he added. UniKL coach I. Vickneswaran said they would not under-estimate Anderson. “Anderson are a good side with skilful players. They also have a good set of coaches and are supported by Thunderbolt (Tenaga Nasional). We are expecting a tough encounter." KINGSTON, Jamaica — Immaculate Conception High School easily brushed aside St Hugh's High 6-0 in the 2016 ISSA/Jamaica Hockey Federation Under-19 competition at the Mona Hockey Field on Wednesday. Ashleigh Thomas led the scoring for Immaculate with five goals, while Deriann Thomas scored the other goal. In other results, Excelsior High School walked over Merl Grove when they defeated them 3-0, while Alpha Academy and Papine High ended at 0-0. In the boys' section, Kingston College went down 0-1 to Excelsior courtesy of a goal from Taffari Dennis.